10 registered (Fuel.inj, vittorio, griffo, Player99, Pmh44, esse16, DCH, SFG, RJW, planenut), 38 Guests and 16 Spiders online. Doesn't seem possible really - 3 years ago I collected my new 4/4 - the most expensive car by at least 20K I have ever bought. I thought I'd share my experiences/views after 3 years and 8000 miles. The first thing I noticed was how helpful this forum is and all its members are. Lots of advice about which model to go for and that they are drive differently-dont' buy on spec etc. Truth be told I couldn't afford a Roadster or plus 4 as I was trading out of an 8 month old 3 wheeler, which had proved to be a love and hate purchase that had to go. So it was a 4/4 or nothing really. 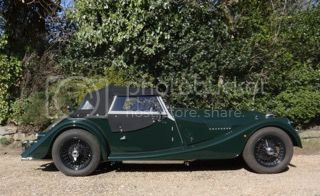 TM was reassuring that the 4/4 was in fact a pure Morgan and not the "poverty spec intro" model. The help continued from TM members with all questions answered and help gladly offered. I have since met a number and what a great bunch of real enthusiasts we all are! Personally I have no issues at with the build quality of my car. Nothing has broken or fallen off - there have been a few rattles that I have enjoyed finding and sorting over the miles. The leather has remained in fantastic condition. What impressed the first day, and continues today is the paint finish - its a credit to Morgans' paint-shop. Now I'm not usually into mods - I have always felt cars are best left standard. This remains true in most cases, but not Morgan. First mod was 1 week in when I couldn't get on with the door mirrors - swapped for round ones to give a better view. Then the BL parts bin Allegro black plastic interior mirror had to go-replaced by a nice stainless one far more in keeping. Slowly I started adding bits - protective edges to the leather rear side panels where the doors close. Then dash lamp bezels from Wolf performance because they look great. A chassis protection rub plate for er...protection. That was about it for a while. The TM advice of the best upgrade was to drive it hard, this was partially done and as the miles grew the engine got livelier and the gearbox smoother. In fact the whole car started to bed in and come alive. I had noticed the 1600 Sigma engine did go really well and was a joy to rev but felt it a bit breathless on motorway inclines - 5th just wouldn't pull as I felt it should. I then chatted to Cain of Wolf performance who had researched and developed a specific ECU re-map for the Sigma engine in its Morgan application. After an unforgettable ride out in his café racer 4/4 I opted to have this installed on my car. The transformation is incredible - the engine is so much happier - torque is increased and its produced lower in the rev band whilst power is upped as well and the engine revs with much more intent. It actually felt like a bigger engine and was the best thing I had done upto that point. Economy - a 4/4 marvel really - remained in the low 40s even when driven like a sports car should, so thumbs up for the re-map. Even insurance wasn't effected. That was it I thought. Car sorted. Well I did bolt on some decent plug leads and some special spark plugs and devised a forced air feed to the air-box which found itself with a KnN filter installed. All little improvements that seemed to make it run that bit better, if not exactly faster. One thing that really bothered me about the car was the banging and crashing from the front suspension. 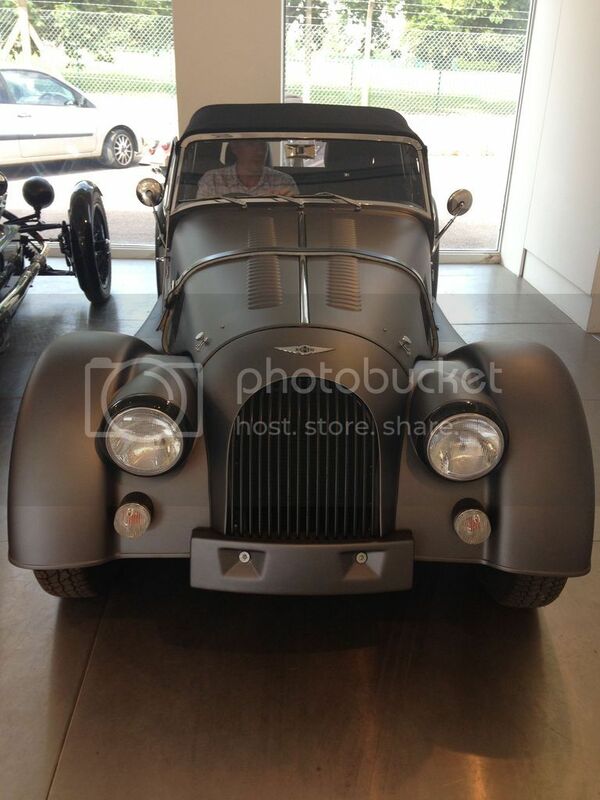 I assumed it was the 100 year old design, its a Morgan, they all do that sir....kind of thing. Just got to live with it. Then Wolf launched PVC lower spring covers with little bearings to assist with steering smoothness. What a great idea - keep the grit and road debris away from the kingpins - so booked myself into have a set fitted. It was then chatting to Cain I mentioned the bang and crashing. All became clear - the racket from the front suspension and associated jarring of car and passengers - was infact the spring bottoming out and the rubber bump stop coming into contact. No they don't all do that and yes its easy to sort out. Brilliant I thought - book me in! So I have had heavy duty front springs and custom bump stops installed together with AVO adjustable dampers ( because the std fit ones are not brilliant) front and rear. While it was being sorted I opted to have brake reaction bars and a Panard rod fitted as well as the steering gaitors/bearings. All this included a full geometry check ( tracking plus camber angles) and a clever tweak to the steering as well. Wow - its truly a different car now - its feels so planted on the road and is comfortable yet stiff and sporty at the same time. Its steers and handles far better than it did and is more akin to a Caterham now. No way does it feel wobbly or fragile, which in hindsight, I think it did. Brake reaction bars - I was told they help stability when braking hard. I don't brake hard so didn't think I needed 'em. Wrong - they tighten the front end up and help the car feel more stable. A cheap addition and easy to fit. Panard Rod - stops the axle moving sideways in hard cornering. Well I don't corner that hard so my axle doesn't do that. Wrong! An amazing upgrade that even your passenger will feel instantly - makes the car feel like its on rails. You'll feel the change on every single roundabout. Pulling away is smoother as well - don't know why exactly but i can feel improvement. AVO dampers. The factory spax ones are not very good quality. Attach one end to a vise and you'll notice they offer far more resistance one way than the other. So an upgrade to dampers is a great idea - not too expensive and easy to install. Having them adjustable allows you to fine tune the suspension to your personal taste - great fun to do as well. Heavy springs. I didn't want a rising rate spring mod because several people who had tried it said it made the front end a little soft on initial turn in. I was after the feel of a westfield/caterham type car more than that of a Merc SL so Cain recommended the firmer set up coupled with adjustable dampers - good choice. The car is more stable - much more so at motorway speeds where it is much more confidence inspiring. No banging on pot holes or rough roads at all - transformed. The re-bound spring bearings/camber tweaks and steering fettling has made it steer with upmost precision in corners. To really set it all off I popped on a Librands sporty type A exhaust silencer which gives the car a lovely deep, mellow exhaust note with wonderfully addictive burble on over-run and a howl at high revs. Not over loud all the time but oh so tuneful... In truth an expensive bit of pipe work that doesn't do much for performance ( you need a decent manifold and sports cat for that) but still worth it for the lovely audio. So to conclude - I have always been happy with my 4/4, however after these few mods I am totally smitten - I adore looking at it, polishing it, looking after it and now it seems can't stop wanting to drive it. This is a long post and my apologies for waffling, however i hope it may encourage a few others to go down the route of minor modifications - you'll be so pleased you did. My sincere thanks to Cain @ Wolf performance for all his advice and work to enable my car to be as good as it is today. Interesting about the suspension alterations , nice to know its possible to improve the ride and avoid crashing when hitting holes in road , wonder why Morgan don't fit those shocks in the first place ? Interesting to read. The re-map route is one I'll be taking once my 4/4 is out of warranty. In fact, we have made very similar improvements and upgrades, andymot. And funnily enough, your way of first questioning the upgrades is very similar to mine. We differ currently only by the panhard rod in your car vs. manifold and metal cat in mine. Everything else went in in the same way over a comparable period of time. It is good to let all this stuff it‘s time as well as we ourselfes need the same amount of time to get used on it, to compare and to enjoy differences. The best thing is, that this improvements are not just noticed for a short while and then forgotten. The opposite is the case, the sum of this alterations makes it another car. The enthusiasm and love that you describe for this model is exactly the same that I experience and enjoy. Excellent write up Andy..I did all of those things with my 2014 4/4 and I can only thanks Cain for all his advice/encouragement as well as tea and cake. Such a dedicated guy with endless enthusiasm for our beloved cars. I loved my modified 4/4 with a passion but my head was turned with the chance to get a Supersports. Lucky Cain doesn't read this Forum...I would hate him to think I like him!!!! Re: the bit about testing of shock absorbers in the vice. Surely it is a natural phenomenon by design of shock absorbers to be stiffer in expansion where they are effectively controlling sprung weight than in compression which is controlling the relatively lighter load of unsprung weight. Don’t think i would dump my shockers on the basis of that alone! Nice write up Andy. I still remember meeting up at the factory when yours had been built (if my memory is right) and mine was still on the production line. So mine is 3 years old now but I dont have a story of upgrades and modifications to tell like yours I’m afraid. The biggest change on mine was when I took it to Techniques for its first service and they re-routed the handbrake cable and did the “flash” ECU upgrade (or whatever it was - I wish I’d paid more attention). Went’ like a scalded cat after that. I do still sometimes hanker for the skinny tyres of the 4/4 but other than that I’m wholly satisfied with mine although in hindsight I wouldn’t have bothered with the radio. Exactly, for competition and offroad extension and compression have their own adjustable setting. Compression must absord a bump relatively quickly, but extension must not return quickly the absorbed energy of the spring avoiding a "racket shock". The main improvement on my PLUS 4 for the front suspension is the SSL (ex Suplex) kit. When changing the dampers with adjustable Spax included in the kit, I changed also the rear dampers with tuned adjustable Spax. A huge improvement. Rear original dampers were completly exhausted. Yes I remember it well - mine was sitting ready for dispatch and yours was in the paintshop where you signed the frame. How fast 3 years go. Plus 4s don't seem to suffer with the bottoming out issue of 4/4s I am told. Due, I think, to stronger springs being fitted at the factory. I have always wondered if i'd use a radio in the Morgan and you have confirmed what I suspected! We have done some of the same mods to our 2011 4/4, I am doing the 4 shocks this weekend. Good to hear it stops the crashing up front, that’s what I was hoping for. I can’t speak highly enough of Cain and Michele either. An enormous help and great friends, supplying me me with parts and always ready to chat on the phone to give me advice when I ask. As have so many others on here that have helped with advice and even buying and mailing parts to me down here in Tasmania too. An excellent write up, Andy..! So glad you're settled & happy with your car. People like you are a credit to the Morgan community. +1 Great stuff, well done Andy. 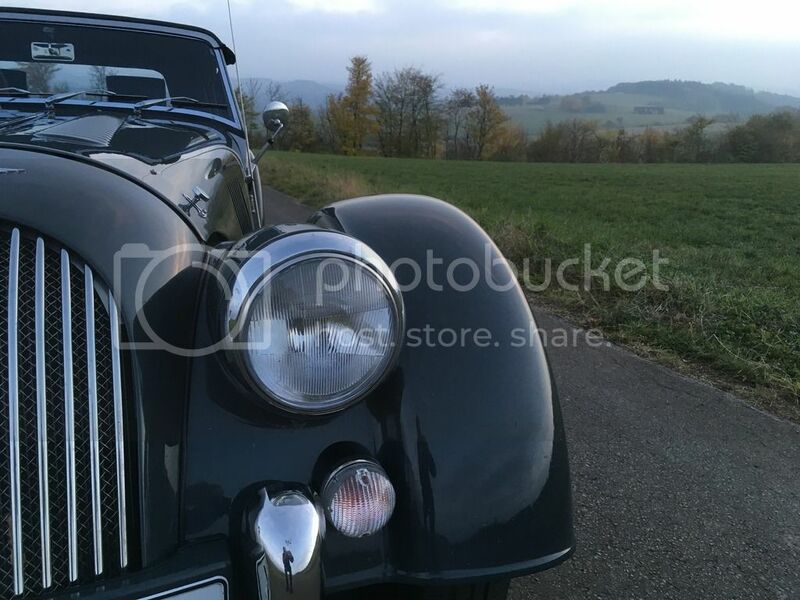 Eloquently makes the case for buying a well sorted second hand Morgan. Do insurance companies need to know about modifications? I was reading a thread elsewhere that they can be quite tricky about any mods. Depends on the insurance company. Basically, the lower the premium the more risk-averse the policy. Decent outfits like Headley, Gott & Wynne, etc will use sensible underwriters who will have a more understanding attitude to modifications. Of the 3 I have owned only the new 4/4 Sport I bought had problems with multiple cracked windscreens, leaking licquorice water tubing and bits falling off as they became unglued to name but a few. So yes there is a very good case for buying second hand when hopefully the PDI has been completed by the previous owner . The 2 Plus8's there were no surprises or bits falling off. Thanks for taking the time to post that, I enjoyed reading it. It’s very sensible to advise your insurance company of any mods. I’ve heard of companies refusing to pay out if a car has stickers on it 😳. I’ve never had problems with Headley....none of my mods, from throttle bodies through to alloy wheels caused any increase in premium. Only two years for me and no modifications, but equally pleased, great to read a happy thread. Interesting reading. I own a 2014 4/4 Sport. The improvements I have made are: panhard rod, break reaction bars, K&N filter, AVO shock absorbers on the rear suspension and the 125 lb springs (of the Roadster) on the front suspension. The plan for this winter is to exchange the exhaust. Cain from Wolf has a very nice manifold and a sport cat is relatively cheap (€ 200). Spring next year I will go for the remap by Cain. Changing, the too weak standard springs made an enormous difference in roadholding and no more kling-klang when hitting speed bumps or potholes. Welcome to the forum, Nagrom, your first post but so you are obviously a frequent reader since more than six years. (BTW I‘m currently in your beautiful country becauce since 14 years two very old friends and myself rent a motor boat for a week to relax in the area of North Friesland, today staying in Woudsend). I have to think again about the Panhard Rod because I was sceptical. Almost every one here, and you as well, Nagrom, who has mounted a Panhard Rod on his 4/4 has only positive comments. Has anyone some experience, hopefully positive, with changing the standard 4/4 Sports ECU by e.g. an Omex or something similar? The new ECU has to communicate with the standard "body box" installed by Morgan. This box communicates with the instruments etc. The changes I already made to the car are: Aero sports exhaust with 200 cells cat and a K&N filter. I am planning for the remap by Wolf Performance in spring (waiting for better weather), but I have worries about the reliability of the standard Ford ECU, tweaked by Morgan. Some advice is welcome. I have worries about the reliability of the standard Ford ECU, tweaked by Morgan. Is your concern about the physical reliability of the ECU, or the reliability of the engine once it is running the changed software? On the former, I cannot see in any way how the ECU itself can be affected by the software it is running, these things are engineered to last years and years and hundreds of thousands of miles. On the latter, Cain's map seems to be very well tested by both him and other customers, and although I have no personal experience on my car, I've heard nothing but good about it. I have the Omex ECU and, as you say, the original ECU is still used for the instruments. If you want to play around with tuning the calibration yourself I guess you could fit one and use it with the standard intake system but IMHO it would be a bit pointless. The Omex ECU is designed to function with individual throttle bodies and, given the availability of excellent remaps for the standard configuration, the expense and effort would not be justified. 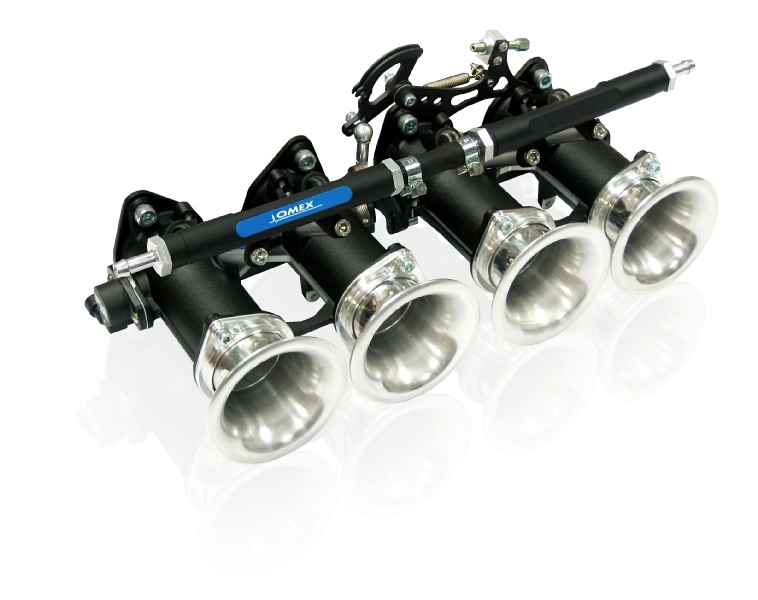 If you really want to have fun and play with the technical stuff get a full set of Omex throttle bodies and the ECU. Morgan AR Motorsport did sell a kit but I don't know if it is still offered. 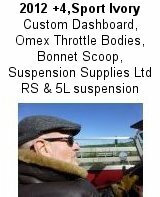 Omex have an excellent kit for the Plus 4 they may have one available for the 1600 4/4 too. Unfortunately not for the Sigma with variable camshaft adjustment on their Omex website. But an ECU remap and a sports manifold will transform your 4/4. I would change that alone at one time. The intake pipes should not be changed at the same time I'm still not convinced of the short pipes, but that should be a different and next topic. Cain did the ECU remap on my 4/4 Sport, but it’s pretty much identical to the Williams Automobiles map. When Williams Installed my ITG air induction kit, I thought it would be agood idea to have the Williams map at the same time (they said there map worked well with the ITG kit) but when they wired it up they advised to leave It, as they are similar. A roll bar does wonders to stiffen the rear end and CNC heads and an aftermarket set of cams following. Also ditch the heavy OEM fly for a TTV replacement. Totally different feeling car after! Many thanks for the replies on my post. I will go for the remap in spring. Also thanks for the suggestion to install a rollbar. I considering it, but I am a little worried about loosing luggage space and a less accessible space behind the seats. I have a 4/4 Sport with spare wheel, so no box to store the side screens. We use the car for holidays. 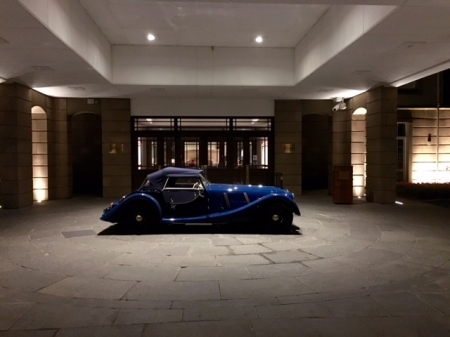 Since I bought the Morgan in Germany, only 1,5 yrs ago with only 6000 km on the clock, the clock now reads 24500 km. We've been to Italy 3 times (Dolomites, Toscany, Umbria, The Marche). We need the luggage space, because I don't want to have a luggage rack.